by Petra Kaiser is a modern-day primer on the basic skills and techniques of fusing. This book is geared toward the novice and assumes you know little about the craft. Filled with lots of step-by-step photos, useful tip sidebars, and complete project instructions. You will learn terminology as well as all the basic skills that are the building blocks of the art. From tools and material descriptions to glass cutting and shaping, to more complicated procedures such as mold making and kiln operation, everything is covered. 80 pages; 175 color photos. Renowned artist and instructor, Jayne Persico, unlocks the mysteries behind the creation of 3-dimensional art glass bracelets. Jayne is the originator of the specialized techniques and tools for this unique kiln forming process and now readers will benefit from her experience as she reveals her secrets using action photos and easy to understand instructions. These bracelets are beautiful and intriguing and they offer glass fusers and jewelry makers a delightful way to expand their skills and amaze their clients and friends. 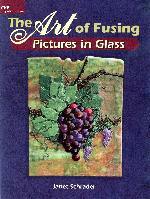 By Janet Schrader is likely one of the finest books that will push your imagination in fused glass. Nothing presented in this book is difficult. The beauty of the book is that it brings a variety of easy to accomplish effects together into one composition. Detailed photos and step by step instruction will get you great results! All contents and illustrations are © 1997 thru 2014 by Sunshine Glassworks Ltd.